It’s no secret that I have trouble staying still. In the last two years I’ve moved to Liverpool, then back to Nashville, then to NYC, then back to Nashville, and I’m now getting ready to spend a full month abroad again, first in Edinburgh (to see if I’d like to live there) and then on a whirlwind trip through Austria, Prague, Germany and France for research purposes. I have a case of wanderlust. But it’s not limited to travel. I struggle just as much to sit still in my skin. Not a day goes by that I don’t wonder where I’d be if I’d chosen differently at any one of the dozen intersections over the last few years. Not a day goes by that I don’t fidget, or open a new word document and jot down ideas for a book I’m not writing, or click through the dozens of browser tabs on my computer, searching photos and music and any other stimuli I can find to calm my mind. I say that I can’t sit still and be still at the same time. When my body is still, my mind is a tangle of limbs, tripping over itself. When my body’s in motion, it’s the only time my mind begins to still, and calm, and clear enough for me to think. Because of this, I spend most of my life in motion. Propelled by the need to be both still and moving. Given the time I have been known to walk more than 10 miles a day (I would probably do more but the remnants of a childhood injury prevent it, and protest the distance I do go). The last few months I’ve struggled mentally and a large part of it has been that I haven’t had the time to move–not travel, but simply get up and walk, run, swim–as much as I needed to. I was trapped in a chair, and my thoughts got too tangled. 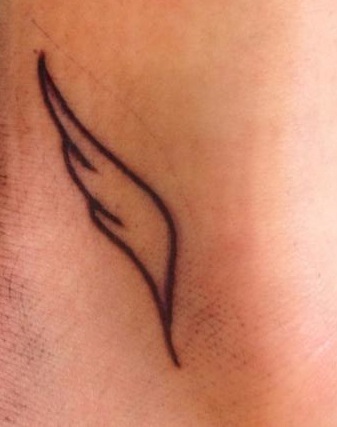 Today I got two tattoos, wings both, one behind each of my anklebones. The wings are of course a nod to the god, Hermes, messenger between the mortal and the divine, and protector and patron of writers (some believed he transported creators from the realm of the mundane to the inspired). But the wings are also a reminder to move (as much as they are an acknowledgement of my ever-present, bone-deep need to do so). I feel compelled to move, but I also feel thankful for the compulsion. Without that constant motion, that desire, I do not think I would be a writer. Moving and creating are, for me, inextricably tied. And sometimes, I need a reminder. *These are not my first tattoos. That fact seems to surprise some people. They are technically my third and fourth. I got my first tattoo when I was 18 (that was the year I graduated from my all-girls school, got cut off all my hair, went skydiving, and got picked up for hitchhiking in France). 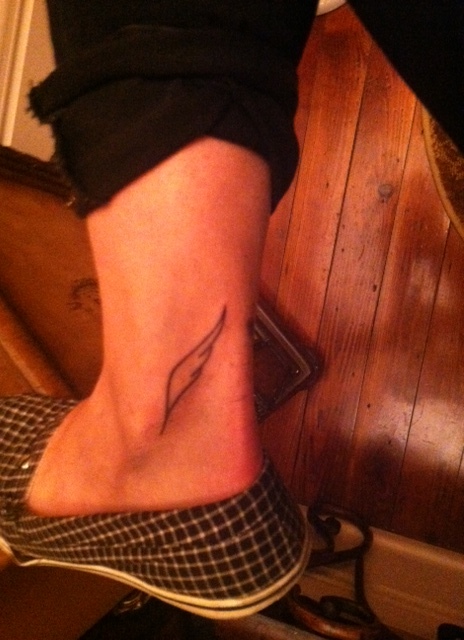 My first tattoo is an eye of Horus (not the same thing as an eye of Ra). My second tattoo I got two years later. It is aut viam inveniam aut faciam, which basically means “Either I will find a way or make one.” Except I was in a rush get this tattoo and it has a typo, the last word spelled facium instead. I could probably logic my way into the misspelling as thematically apt, but the fact is it was a mistake. Despite a perfectionist nature, I decided to keep it as a lesson to myself not to rush into things. Which is why it’s been five years since I applied any permanent ink to my body.